Oxford grey t-shirt with "tongue in cheek" undefeated York College Football screen-print on the front and back of the shirt. Gildan sweatshirt made with preshrunk fleece knit, double-lined hood with color matched drawcord, quarter-turned to eliminate center crease, double-needle stitching at waistband and cuffs, pouch pocket, 1x1 rib with spandex, and satin label. Gildan hooded sweatshirt features preshrunk fleece knit, air jet yarn for a softer feel and reduced pilling, tear away label, double-needle stitching at shoulder, armhole, neck, waistband, and cuffs, 1x1 rib with spandex, and quarter-turned to eliminate center crease. Gildan YC Shield Long Sleeve tee features preshrunk jersey knit, seamless double-needle 7/8" collar, taped neck, and shoulders, tear away label, rib cuffs, double-needle bottom hem, and quarter-turned to eliminate center crease. Gildan YC Shield tee features preshrunk jersey knit, seamless double-needle 7/8" collar, taped neck, and shoulders, tear away label, double-needle sleeve and bottom hems, and quarter-turned to eliminate center crease. 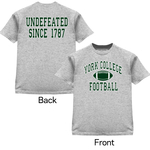 Gildan unisex tee features York College over Spartans in a distressed look. 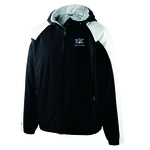 A fall and winter classic York College sweatshirt. 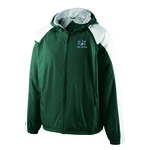 Holloway two-tone jacket offers a lightweight, soft outer shell, an adjustable hood, hidden drawcord inside the hem, dual front and chest zippered pockets, and internal Storm cuffs for weather protection. Holloway Electrify polo features two-color heather pattern and high mechanical stretch make this shirt the perfect choice for the golf course or the boardroom. Holloway Ladies* Energize Shorts feature Dry-Excel Perform technology to wick away moisture, Dry-Excel Elite micromesh for extra ventilation, elasticized drawstring, and a 3.5" inseam. Holloway ladies shift polo features Dry-Excel horizontal, textured stripe with high mechanical stretch, and self-fabric collar. Holloway Bash shorts are made from dry-Excel Micro-Interlock material that wicks moisture and resists odor and features an elastic drawstring waistband and contrasting side stripe for a unique style. Holloway Electron shorts feature snowy heather fabric and a bold, two-color pattern with side pockets, elasticized drawcord waist, and a 9" inseam. Holloway Shift polo features high mechanical stretch, snag resistant and moisture wicking fabric. Holloway Tonal 1787 quarter zip jacket features wicking knit top body, collar, and set-in sleeves. Holloway Quarter zip features dry-Excel technology to keep you dry, raglan sleeves, and 1/4 zip neckline with reflective zipper. League Academy Crewneck sweatshirt offers a ladies fit* made from a suede, cotton-rich fleece and brushed for extra softness.